MCX COMDEX captures diversified sectors encompassing futures contracts drawn on metals, energy and agricultural commodities that are traded on MCX. It is the significant barometer for the performance of commodities market and would be an ideal investment tool in commodities market over a period of time. The MCX COMDEX futures give users the ability to efficiently hedge commodity and inflation exposure and lay off residual risk. Protection can be established regardless of overall market direction. 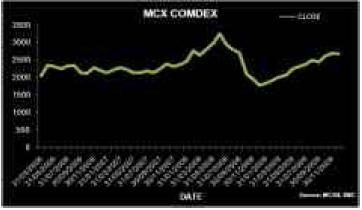 MCX COMDEX, India’s first composite commodity futures index was launched on June 7, 2005. Investors who own stocks of companies having exposure to primary commodities could use the COMDEX as a guide to hedge their risk in the commodity exchange, thereby bringing stability to the financial markets and strengthening linkages. Weight age (%) of Commodities in MCX COMDEX: . On the MCX-COMDEX, Agricultural sub-group carries 20% weighting. It includes ref. soy oil, potato, chana, crude palm oil, kapaskhali & mentha oil. Metals also carry 40% weighting and comprise gold, silver, copper, zinc, aluminium, nickel & lead. The energy sub-group consists of crude oil & natural gas and carries 40% weighting. The chart above depicts that with the bull-run in commodities, this index has outperformed throughout in the year 2009, as compared to other years, where they had shown a sideways movement. 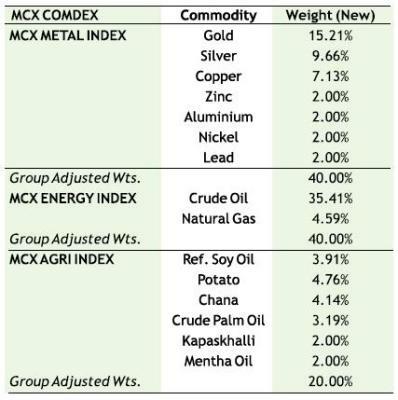 Also Group Indices for MCX AGRI, MCX METAL & MCX ENERGY on commodity futures prices have been developed to represent different commodity segments as traded on the exchange.